Just a few of the conditions that can be treated at the Alberta Laser Rehabilitation Centre (ALRC) are sports and repetitive stress injuries, arthritis, neck and back pain, sciatica, migraines and a number of dermatological conditions. Laser therapy also improves recovery from soft tissue and muscle injuries. The number of additional medical conditions that laser therapy can treat is vast. Laser therapy is a safe and effective treatment for the elimination of pain. It is ideal for health-conscious people who prefer natural healing methods and who are tired of having to take painkillers and the negative side effects involved with their use. 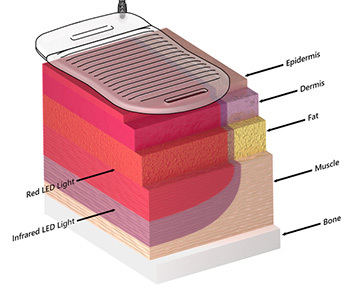 Laser therapy uses the power of red and infrared light to induce and support the healing process. Cells in the affected muscles, tendons, ligaments and tissues absorb the energy from both types of light, leading to a series of physiological reactions that restores cell structure back to normal. During laser therapy, mitochondria (the powerhouses of every cell) release protons, allowing for the production of energy-rich molecules like ATP (adenosine triphosphate), which provides the energy needed to reduce inflammation, promote healing and repair injuries. Instead of simply masking symptoms, laser therapy targets the cause of pain, and the results are permanent. Due to physiological differences in each person, results may vary. For most patients, however, the improvements are noticeable within three to five treatments. Many notice a difference right away! Laser therapy a non-toxic and non-invasive way to eliminate pain, reducing the need for pharmaceuticals. Normal ranges of motion and physical function are restored with no known adverse side effects. Laser therapy can eradicate the need for surgery and provides an alternative for those who have found conventional therapies to be unsuccessful. Low Level Laser devices are also use as pain relief of the following conditions. Pain associated with muscle spasms. Hand pain and wrist pain associated with Carpal Tunnel Syndrome. The patented BioFlex technology has been approved by the FDA, Health Canada, UL and CE for the treatment of a wide range of medical conditions. This new generation of laser can penetrate much deeper than the previous laser units and deliver results in a fraction of the time.